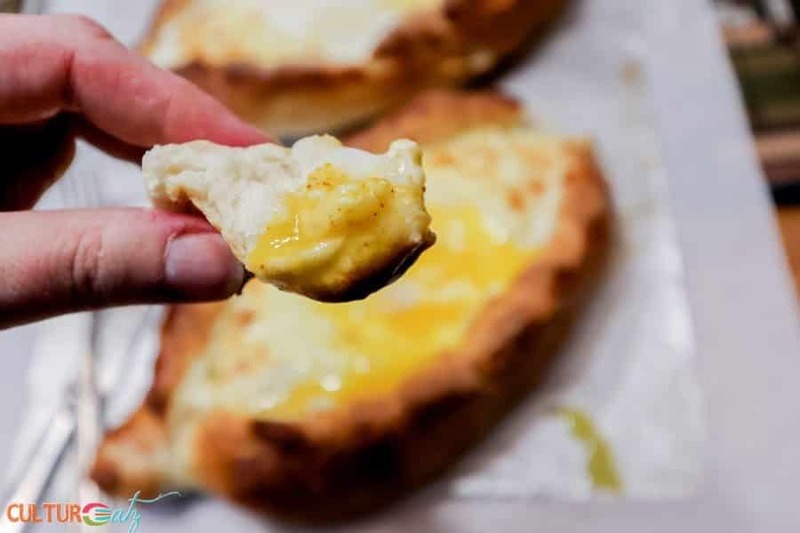 Have you tried Acharuli Khachapuri? 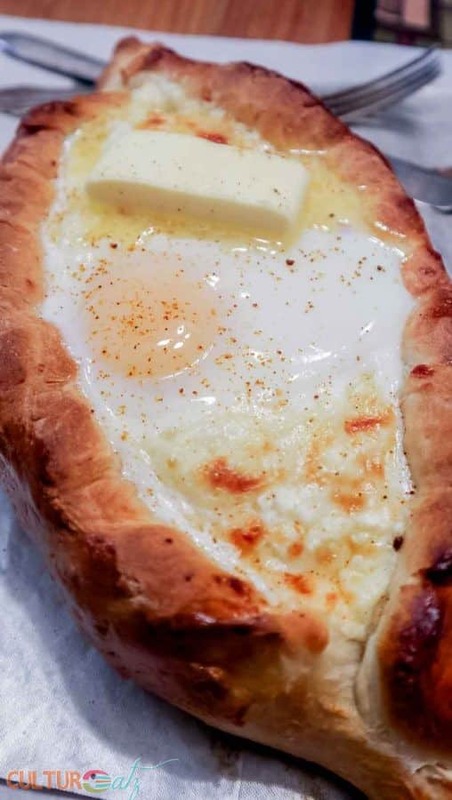 They are heavenly Georgian cheese stuffed bread boats, finished off with a baked egg and pat of butter. It’s my new comfort food. One can find a multitude of Georgian cheese stuffed bread recipes in Georgian cuisine (the one in Europe). The common term for these breads is Khachapuri, which means curd bread. Some regions are famous for unique khachapuris. Today we will make the Adjarian version is shaped like an open boat, called Acharuli Khachapuri. These pillowy bread boats are brimming with salty cheese and are topped with a runny egg and a pat of butter before serving. No wonder it is the national dish of Georgia, and the national comfort food. And they are my new personal comfort food too. I have been dying to make Acharuli Khachapuri ever since my article where I asked travel bloggers to share their best meal while traveling. A blogger submitted this gorgeous Georgian cheese stuffed bread and I was smitten! In fact, I was originally going to make the recipe for last month’s edition of the Eat the World recipe challenge where we visited the country of Georgia. Alas I was very ill (still at home sick by the way) and could only find the energy to do a spice mix at the time. Turns out a pinch of my Georgian Ajika dry spice mix was the perfect finishing touch to my Acharuli Khachapuri. 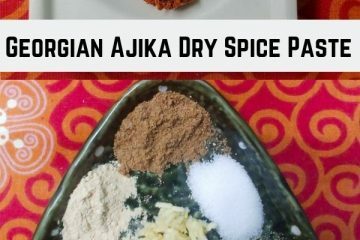 Actually, this spice mix is good for everything! Meats, potatoes, veggies! So check it out. The dough recipe I got from a traditional Georgian recipe but they lost me at the filling instruction. Curious Cuisinière did a much better job at explaining the right steps for the filling and how to prep the boats while keeping the recipe authentic. The dough is very yeasty in taste which I think can be common with that part of the world. The bread dough is similar to pizza dough, yet loftier. You will be amazed by how much it will rise while baking. The cheese used for this dish is the traditional Georgia cheese called sulguni. Odds are you will not come across this delicious soft salty cheese outside of that country. But here is a great substitution: mix roughly 3/4 of mozzarella and 1/4 of feta together for the closest taste and texture. You may panic at the size of one boat once they finally come out of the oven. They are huge. That is why I recommend serving half a boat per person. With a side of salad for a good conscience. For lunch, a quarter of a boat goes great with a cup of soup. 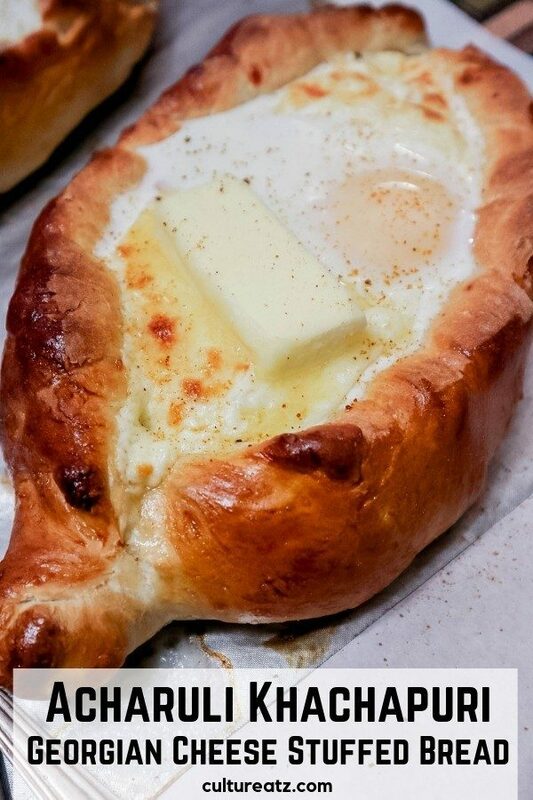 Once served, this is how you want to devour your Georgian cheese stuffed bread boat. Mix the butter and egg with a knife and fork and slather it over the cheese surface. Now tear off pieces of bread with your fingers, dip the bread into the egg and enjoy. The recipe lived up to the high expectations I placed on it. Nay, it surpassed them! If gooey cheesy bread dipped in egg yolk is not heaven, I don’t know what is. Have you tried Acharuli Khachapuri? 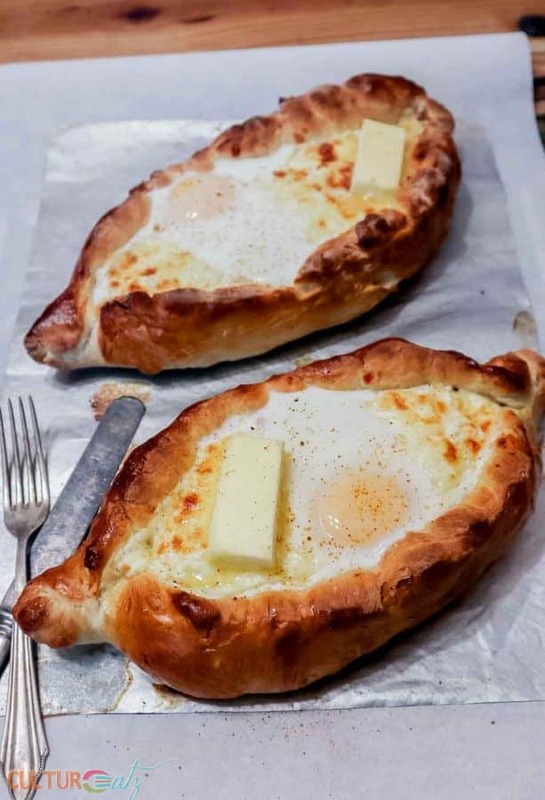 They are heavenly Georgian cheese stuffed bread boats, finished off with a baked egg and pat of butter. Warm the water to 35 F (35 C). Stir in the yeast and leave to rest for 5-6 minutes to activate it. In a large mixing bowl, add 1 kilo of flour and make a well in the center. In the well, add the yeast water, sugar, salt, oil, milk, and one egg. Mix the ingredients from the middle of the bowl until a ball of dough forms. The dough should be soft and tacky, but not sticky. You may need to add more liquid depending on the humidity level (I needed a lot more in winter). Cover the bowl and leave the dough to rise in a warm place for 2 hours. The dough will look spongy. Preheat your oven to 475 F (246 C). Knead the dough and add a bit the remaining flour as necessary if the dough is sticky. Separate into 4 equal portions and leave to rest for 10 minutes. In a small bowl, mix the shredded mozzarella and feta cheese with one egg. Set filling aside. Shape each ball into a flat pointy oval (width of the baking sheet) on two flour-dusted baking sheets. Spread a quarter of the cheese filling in an oval shape in the center of each boat. Keep it packed and smooth on top with a spoon. Fold the sides of the dough in to create an edge and pinch the ends into points. Leave to rest for 10 min. Bake for 12 minutes, or until lightly golden. Beat one egg in a small bowl for the wash. Remove from the oven, brush the wash on the dough and crack an egg over the cheese on each boat. Bake for 3 to 4 minutes, until the egg has just set but not fully cooked and the yolk is still runny. Serve warm and topped with a generous pat of butter. I hope you're finally on the mend! Love these cheese/egg boats! I'd have to scramble my eggs a bit, but Bill would love your version as is! Such a fun idea. You know what, yes I am starting to see some improvement in my health, finally! Thank you :-) Well you could always et your cook a bit longer in the oven. This is a real WOW factor recipe. 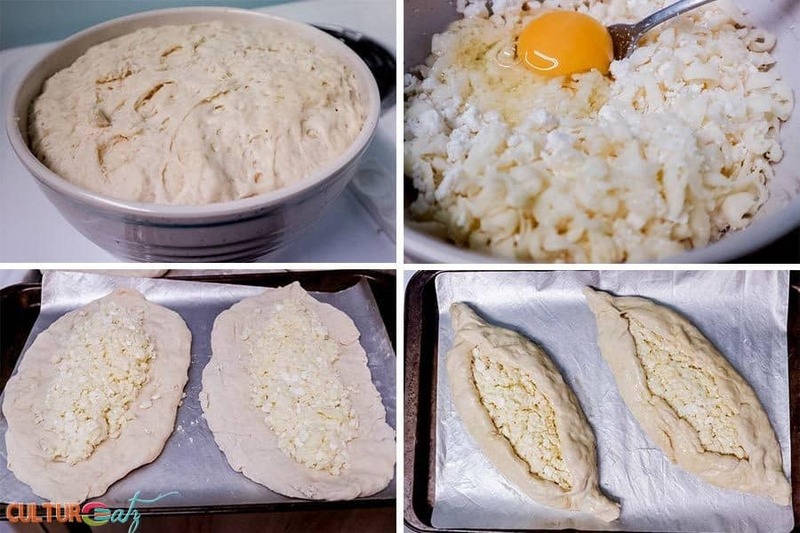 Oh Evelyne...and no...I have never tried Acharuli Khachapuri...and would love to...looks delicious and oh...that runny egg yolk...thanks for the recipe. Hope you are having a great week! Thank you Juliana. 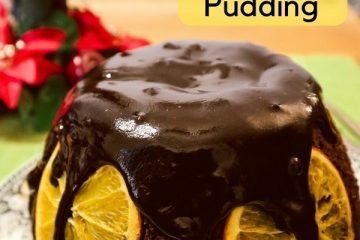 I hope you give this a try, it is really a WOW factor recipe. And yes, love runny yolks too. First of all, congrats on the new baby :-) Ans sorry to do that lol. Pin it so you can revisit once you can start indulging a bit lol. I adore khachapuri, but only tried making it once, from a recipe in an old Georgian cookbook I was given. Yours looks far better, so I need to give this recipe a try soon. So cool you know this and have made it. Yeah, I had to combine a few recipes to get it right. this one is a winner. I haven't tried these yet, but I'm a cheesehead so I'll definitely try them when I get the chance to visi a Georgian restaurant. :D :) (or maybe try to make them at home) Thanks for sharing! If you are a cheesehead than this is a MUST eat for you. Do you have a European Georgian restaurant near you? We have only one and not sure they had it on the menu even. This is completely new to me - I've never heard of anything like it … but it sounds delicious. I hope the Georgian people won't mind if I spritz a little hot sauce on one! LOL I am sure that is fine to add a little hot sauce. It is really awesome, even better tasting than it looks! OMG my mouth is watering and stomach is growling. This looks absolutely awesome! Can't wait to make them. Thanks! Guess, what it tastes even BETTER than it looks, seriously! They are the bomb, so amazeballs. Well, you need a cheese that melts, think pizza. Jeez, still at home sick? Poor you! At least you have these to comfort you -- what a terrific looking dish! Wonderful recipe -- thanks. Yep, and just back from doc, off till at least April 22 and new list of meds. I only have part of one left lol, they are so freaking amazing! wow I am in heaven! A half boat for one...nay..I need the WHOLE one!! LOL trust me, they are HUGE. But I won't stop you.